The Stafford Canary, the first new canary variety since the Fife Canary which was developed in the 1950's, is a real dandy! The Stafford Canary has a rather unique development, the standard for this bird was created before the final canary breed was actually developed. In the 1970's an inspired group of breeders, aware of a red/rose canary variety that existed in Europe called the 'Deutche Koife', wanted to create a red/rose crested variety. Thus they decided on the standards and proceeded to develop the canary type. The Stafford Canary is a "type canary", bred for physical characteristics rather than color or song. They are a newer canary variety, originating as a cross between the Gloster and Red Factor types. They can be either a crested or non-crested version and they have red and rose ground colors. Being quite beautiful, they have created quite a stir among fanciers. Distribution: The Stafford Canary is a new variety of canary that was developed in the the 1980's in Stafford, England. Their first appearance on the British National Exhibition bench was in 1987. Here Zoe Finn, the daughter of Peter Finn who was one of the pioneers in the development of this variety, exhibited what was to become recognized as the Stafford Canary, at the Perry Hill show in Birmingham. The Stafford Canary Club formed in 1988. They applied and received acceptance of the Stafford as a new breed of canary by The Canary Council of Great Britain in 1990. In 1992 in America, the National Cage Bird Show added the Stafford in the Type division, and today either crested or non-crested birds can be shown. Description: Fairly short compact birds, the Stafford Canary is 5 inches (12.7 cm) in length. 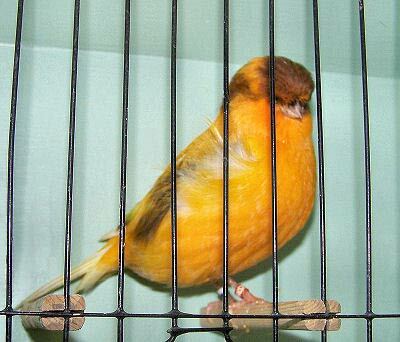 As a "type canary", they are bred to accepted type standard, meaning they can be clear, variegated or self. They come in bright red and rose ground colors evenly distributed throughout the plumage, with melanistic coloring in the self's. There are three feather types, non-frosted, frosted, or mosaic (dimorphic) and they can be crested or non-crested. Breeding/Reproduction: Canaries breed easily and readily if provided with quality food, lighting, secure surroundings, and conditioning. They are best bred in breeding cages. Availability: Stafford Canaries can be obtained, but often it will take getting placed on a waiting list with a breeder as there is more demand than availability. They can be found primarily through breeders, but may also occasionally be found through bird shows and on the internet. Authors: Denise Taormina and Clarice Brough, CAS. They can depending on environment. i want to start breeding these canaries wheir do I start? I have the crested Staffords in Washington state. Sales prices are $75 - $100, depending on the quality. Looking for a crested male something along the lines of a red variegated mosaic. Do you happen to have any available now or soon or know anyone anywhere near Portland, OR that might? I am looking for a non-crested stafford hen to pair up with my male, do you have any for sale? Hey Teri, Dave in Denver here. I was wondering if you still have you Staffords. Shoot me back an e-mail. Thanks, Dave DeVries. Please e mail to the above address. I will buy any amount of canaries you have. Hi there. I'd like to have all picture of stafford canary that you have available ,can you send them over to my email? I'm looking for red color w/crested on its head, and how can I order and pay you?Thanks.